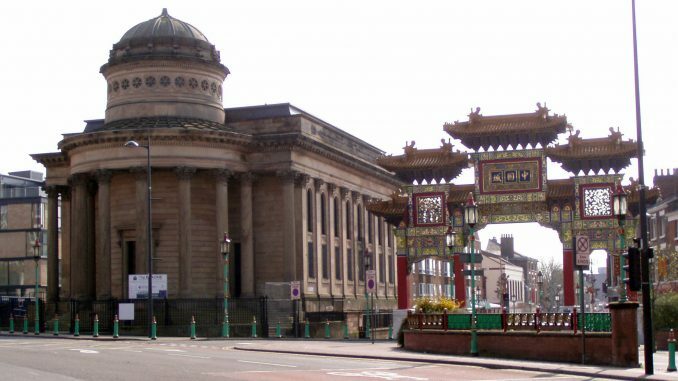 The rebuilding of Liverpool’s Great George Street Congregational Chapel in 1840 also resulted in the city acquiring a significant new organ by the pre-eminent British builder of the 19th century, William Hill. The original chapel, built in 1811, was destroyed by fire 19th February, 1840. The foundation stone for its replacement, designed by city architect Joseph Franklin with a no-expense spared brief, was laid 7th July the same year. Popularly known as Liverpool’s “third cathedral” while it was a place of worship, the building today has been re-named the Black-E and functions as a community and contemporary arts centre. The contract for building the new organ was given to William Hill & Son. The firm, founded by William Hill (1789-1870) who had worked for, and married the daughter of, organ builder Thomas Elliot. By this time, Hill had already built the organs at York Minster and Birmingham Town Hall. These had been constructed in the traditional style that carried on the work of “Father” Bernard Smith (c 1630-1708) and Renatus Harris (c 1652-1724) and who had heavily influenced organ building throughout the 18th century and into the early Victorian period. 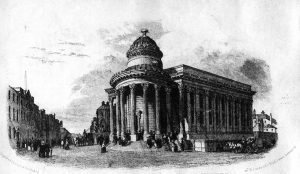 The new organ in Liverpool was opened 31st December, 1841, three months after the chapel itself was opened. What was significant about this instrument was that it broke with the Smith and Harris tradition and drew influence instead from the organ builders in Holland, France, and Germany – the so-called “Continental organs” – and in particular those built by Christian Müller (1690-1763) at the Protestant Grote Kerk in Haarlem, and the instrument by Andreas Silbermann (1678-1734) in Strasbourg Cathedral. The Liverpool instrument, while built by William Hill, was designed by the Shropshire-born organist and composer Henry John Gauntlett (1805-1876) who was also supervising a similar new organ at Christ Church, Newgate Street, London (see further The Making of the Victorian Organ by Nicholas Thistlethwaite, Cambridge University Press 1999). The William Hill organ of 1841 was unfortunately vandalised almost as soon as the chapel was closed in the 1970s and eventually scrapped, a victim of indifference at the time to these historically significant instruments along with much else that was Victorian. A similar organ, originally built four years later by William Hill for the Eastbrook Methodist Chapel in Bradford, is now installed at the Wesley Methodist Church in Cambridge. NEW ORGAN ON THE PLAN OF THAT AT HAARLEM. The repeated visits of the great composer and organ performer, Felix Mendelssohn to this country has had a most beneficial effect on the members of the musical profession, and not least so on our organists. He was the first who introduced to the musical public the brilliant and fantastic forms of the church concerted fugue, as it is found in the works of Sebastian Bach. The late Samuel Wesley, lover as he was of the organ, and master of its every power in its English form, declared his inability to comprehend how the fantasia of Sebastian Bach could ever be performed on the organ; for such were the grandeur and solemnity of its composition that he looked upon it as unfitted for that instrument. But Wesley had never heard the Haarlem organ or any grand instrument, like those in Strasburg Cathedral, the Catholic and Lutheran churches at Dresden, the convent at Mafra, the cathedral at Seville, the Lutheran chapel at Frankfort, the minsters at Beauvais and Freyburg. In this short catalogue is included nearly every celebrated organ of any merit; and if our readers turn to the pages of an encyclopedia, or any other book on arts and mechanics, they will find one or other of them mentioned as masterpieces of skill and well-springs of melody and harmony. The distance between the subline and ridiculous in music is not very great. The Hallelujah chorus, on most parish church organs in England, is at once an exemplification of the possibility of the combination of these feelings. Mendelssohn performed the grand fugue of A minor, the composition of Sebastian Bach, on St Paul’s Cathedral organ, and also on the organ in the hall at Birmingham; but, although every professor was at once carried away with the great artistical skill of the player, there was no feeling of grandeur or sublimity excited. Amateurs asked what was the matter with the instruments. They had been accustomed to hear these organs with six, or eight, or ten keys held down together, but Bach permits only three or four together, generally three, the pedal part for the feet making the fourth, which only appears now and then. These organs, as Mendelssohn played them, lost all their adventitious, or rather spurious, grandeur, and it was evident that, for the purposes of real and legitimate organ performance, the English organs had been misconstructed. Our organ builders, for the most part, build their instruments on the plans adopted by Harris and Smith, who came to this country after the great fire in the reign of Charles II. As the organ was then laid out so it is now by our builders in the reign of Queen Victoria. But not so in Holland, France, or Germany. The grand organ of these countries is quite a different instrument in its acoustical proportions. Mr. Hill, the builder of the York and Birmingham organs, erected their monstrous piles of church harmony on the plans of Harris and Smith, which for the purposes of pure part playing, that is, in other words, using only three or four notes at a time, have proved each of them failures. An attempt was, therefore, made to build an organ on the model of the gand organ of the Continent. Through the liberality of the parishioners of Christ Church, Newgate-street, who devoted £250 to an alteration of their organ in 1839, and a further donation of £600, the munificent bequest of James Boyer, Esq. clerk to the Coopers’ Company, a son of Mr. Boyer, a former master of Christ Church, and under whom Coleridge and Lamb, and many other celebrated literary characters, received their early education—the Christ Church organ was pulled down to the floor and re-erected on the principles of the continental organ builder. The organ had, within the 10 years previous to 1839, cost upwards of £1,000 in alterations; but as the design of Mr. Gauntlett, under whose superintendence it was rebuilt, was to make the instrument the most superb manual organ in Europe, £900 was found to be insufficient to effect its completion. The money, however, was disbursed in perfecting the design, which has been done. The only part left unfinished is the putting in of the pipes. The mechanism is all complete, and £300 or £400 only is required to make it the most perfect and varied organ in Europe. Already there is no instrument on the Continent with so enormous a body of tone. This was bringing into existence what had long been felt to be a desideratum in organ building—English tone with the German combination of pipe. Mr. Hill followed the principles adopted by the celebrated organ builders of Germany, in the compass of the manuals and the mode of blending the stops; but in purity, power, and grandeur of tone, he has rivalled the efforts of his predecessors. He has imitated them in the plan of confining the manual to 54 notes (from CC to F in alt), because it condenses within a compass of four octaves and a half every pipe from the CCCC (32 feet) to the smallest that can be made to speak—a compass of upwards of seven octaves;—it secures the greatest weight of tone to the manual that can possibly be given to it; it brings every combination of pipe within the grasp of the performer; and it enables the performer to play as written, and with ease to himself, the compositions of the most celebrated organ composers. He has, however, increased the extent of the pedal board, which now embraces two octaves and two notes (from CCC to D), a compass which is required in the execution of the music of Sebastian Bach. He has secured the weight of tone necessary to form the foundation of a grand organ, by the introduction of the contrabourdon and bourdon stops; the first places the CCC pipe on the tenor C of the manual, and in the immediate reach and constant use of the player; the second, which places the CC pipe on the tenor C of the manual, he has made an entirely new stop, by an alteration of the scale hitherto in use. The weight of tone given by these stops has enabled him to introduce the novelties of the quint or double twelfth, and the tenth or double tierce, and to complete a new combination of the compound stops called sesqui-alteras, mixtures, furnitures, doublettes, &c. whereby are produced those brilliant and silvery qualities ot tone which give life and animation in the ensemble. In all these alterations from the mode of blending the stops hitherto adopted in this country he has acted in the spirit of the old and most celebrated builders of Holland and Germany. But in variety of tone he has made improvements, which he ventures to suppose have not been surpassed any builder of ancient or modern times. In the reed stops, he has invented seven new forms, as exemplified in the grand ophicleide, the contra-fagotto, the trombone, the clarion, the corno-flute, the cromorne-flute, and the clarionet, or chalemeau. In the flute stops he has adopted wald-flute, oboe-flute, suabe-flute, flageolet, and two kinds ot piccolo; and he has enriched the swell organ by the introduction of the new stop called the echo dulciana cornet, a stop of five ranks of pipes, of the delicate scale and voicing in use for the organ of the drawing-room, and which has proved a most valuable addition to the resources of the performer. These principles were carried out subsequently in the organs of St. Peter’s, Cornhill; St. Luke’s, Manchester; and St. Paul’s, Sheffield, and that in the noble church at Stratford-upon-Avon. But an opportunity was wanted to bring the grand organ of Genuany into its primary use, to bear upon some two or three thousand voices singing the psalm tune like the Lutherans of Upper Germany, and the Protestants in Holland. The grand organ is, in reality, a creation of the Protestant church. Great congregations require great organs; and there would have been no Haarlem organ but for the Haarlem Protestants. The destruction of Dr. Raffles’ chapel at Liverpool, about two or three years since, has opened the way for the introduction of the grand organ amongst the independent dissenters. The chapel has been re-erected without reference to expense, and is one of the most splendid edifices in England. The building of the organ was given to Mr. Hill, and the design left to Mr. Gauntlett. The subscription being only about £1,000, the whole of the details of the continental organ could not be brought into operation. But it was determined to avoid the rock on which the English builders had wrecked themselves. The English builder makes an organ of three rows of keys, none of which are grand. The German builder, if he has not money enough to make an organ of three rows of keys, makes one of two rows, if not enough for two rows, makes one with only a single row of keys; but then it is a grand organ. The money divided into three rows of keys makes an organ on which to play pretty and soft music; but the grand style of accompanying a psalm, the grand chorus or fugue is unapproachable on such an organ, in fact impossible. Noise and confusion takes the place of sublimity, and music is deprived of its power over the hearts of its worshippers. The Liverpool organ has been constructed as nearly, therefore, on the plan of the Haarlem as the funds appropriated to its erection would permit. To make a large pedal organ (for the feet) without having an equally large manual organ (for the hands) would to commit the error which has recently been perpetrated in that noble building, Dr. Hook’s new church at Leeds, and also by the founders of the organ in Exeter Hall. The first row of keys in the Haarlem contains 16 stops. That at Liverpool contains 19. The second (equal to the English swell) contains 15 stops, the Liverpool 20, being the largest swell yet erected in Europe. The choir organ of the Haarlem has 14, the Liverpool eight stops. The height of the chapel at Liverpool forbade the introduction of the 32 feet pedal pipes, but the pedal organ has been made as weighty and as solemn as possible by three CCC pipes and there a preparation for one CCCC. The octave and mixture stops in the pedal have been obtained means of a copula from the fine and magnificent swell organ. The instrument was opened on Friday, before an auditory of upwards of 2,000 persons. The whole of the vocal strength of Liverpool was gathered together, and some of the choicest movements of Handel, Haydn, Mendelssohn, Mozart, &c. were sung with great taste and precision. Mr. Gauntlett presided, and the value of the many different flute, reed, and diapason stops became very apparent in the changes made in the accompaniments. In addition to these novelties there is the tuba mirabilis, of which the only other yet made in Europe is that added to the Birmingham organ for the festival of last year. On Saturday and Monday Mr. Gauntlett performed many of Bach’s most celebrated fugues, and the organ was pronounced, by those who had heard the great continental organs, to be surpassed by none. On Sunday, when the place was crowded to the ceiling, and all present may be said to have sung, nothing short of the tuba mirabilis in the Luther’s Hymn could be heard paramount, such was the body of tone from so numerous a choir. The Liverpool instrument is at present the finest in England, because perfect. The Christ Church organ has only to be finished to make the object universal attraction and curiosity.